After auctioning five juveniles this past spring without sending the horses hard in timed under-tack breezes, the aptly named Gulfstream Gallop LLC had already been planning to give the concept a go again in 2019. But when the first filly to start from that consignment wired a Del Mar MSW field on Aug. 18 by 5 3/4 lengths, it only emboldened agent Kip Elser of Kirkwood Stables to be on the hunt for a slightly higher class of yearlings–and potential new sales partners–to expand upon the concept of focusing on the juveniles themselves and not on the clock. Splashy Kisses (Blame), a $30,000 purchase out of last year’s Fasig-Tipton Turf Showcase sale, sold for $100,000 at FTFMAR to Dennis O’Neill on behalf of ERJ Racing. Trained by Dennis’s brother, Doug O’Neill, she debuted eighth on July 18 at Del Mar, then flashed strong speed straight from the gate in a six-furlong sprint to win start number two for owners ERJ Racing LLC and Dave Kenney this past Saturday. 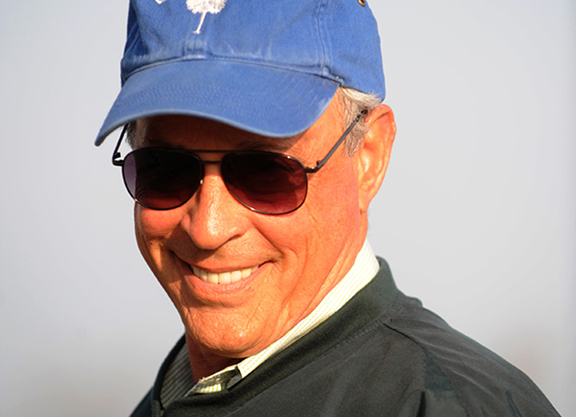 Elser, speaking on behalf of the silent partner who came up with the idea for eschewing the current convention of participating in the one- or two-furlong pre-sale breezes, noted that of the five yearlings the group purchased specifically for that purpose, four sold at the Fasig-Tipton sale at Gulfstream in March and one was bought back and later re-sold at Fasig’s Timonium sale. The new partners could mean that Kirkwood will represent a second group of sellers separate from the initial Gulfstream Gallop venture, the founder of which wishes to continue as a silent entity. “He doesn’t want credit or blame. He loves the game, and he was very brave to come up with the idea in the first place. He just wants to enjoy it and do it privately,” Elser said. The consignment’s second starter, Irish Hustle (Data Link), was also a $30,000 FTKTUR buy. She resold for $65,000 at FTFMAR and debuted with a 10th-place finish in a Monday MSW turf sprint at Saratoga. Elser was asked what he learned from the first go-round of non-breezing juveniles that might change what he does the second time around.